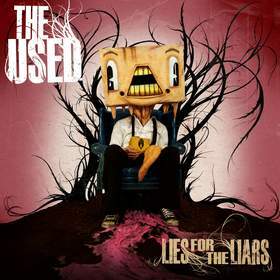 BURBANK, CA -- (MARKET WIRE) -- April 23, 2007 --Reprise Records will release the third album from platinum-selling rock band The Used, "Lies For The Liars," on May 22nd. The band -- which features singer Bert McCracken, guitarist Quinn Allman, bassist Jeph Howard, and new drummer Dan Whitesides -- began writing the songs on "Lies" in early 2006 after taking time off to decompress from a relentless touring schedule in support of its previous album, 2004's Top 10, gold-certified "In Love and Death." Needing a change of pace, McCracken moved from the band's hometown of Orem, Utah, to Los Angeles, where he says he discovered "the most fake people I had ever come across on the whole planet. They're all just liars. Being in that environment had a direct effect on this new record, which is a little more vicious, but in a strange way, also more loving and caring." With songs that range from classical-tinged melodrama to thunderous, bombastic rock, "Lies For The Liars" is a deliberately experimental, emotional, sonic exorcism. "We definitely didn't want it to be anything like our first or second records," McCracken says of the new album, which was produced by John Feldmann (The Matches, Goldfinger, Story of the Year). "We wanted to experiment more than we ever had and take any new idea and run with it as far as we could." In that vein, "Lies"' first single, "The Bird and The Worm," fashions vibrant strings and post-punk rhythms into a mélange of theatrics and desperation. "We decided to make it almost overdramatic," McCracken says. The single has exploded into the top 20 on the modern rock charts in its first week and is currently available for purchase on iTunes. The Used, which now features touring drummer Dan Whitesides as a permanent member, will be making a series of live appearances surrounding the release of "Lies For The Liars," including select headlining shows on this summer's Vans Warped Tour (see dates below). In addition, they will perform on "Jimmy Kimmel Live!" on May 17th, online at AOL Undercover Sessions, which premieres the week of May 28th, and on MySpace's new live show "The List." That appearance will be filmed on May 23rd in Australia, where the band will be touring, and featured on MySpace for the following three weeks. The band has recently finished up a two-month stint headlining the third annual Rockstar Taste of Chaos Tour. In February, they released "Berth," a live CD + DVD recorded and shot during the band's tour in Vancouver, BC, as well as footage about the making of both "In Love and Death" and "Lies For the Liars." For more about The Used, please visit their website www.theused.net, or dedicated YouTube channel www.youtube.com/theusedchannel. Also, check out the new single "The Bird and The Worm" at http://www.rhapsody.com/theused/thebirdandtheworm.